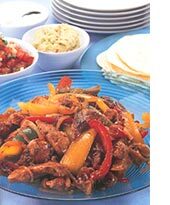 Check out our Mexican Fajitas Recipes section! Fajitas have been the rage throughout the Southwest and Mexico for several years now. This recipe came to me courtesy of our waiter at the La Concha Beach Club, which is right to the north of the famed Melia Cabo Real resort in Los Cabos. It's home to a gigantic tide pool-a naturally occurring salt water formation big enough for plenty of people to swim in, with enough room for us to dive off the rocks and play in the waves, enough room even for us to frolic with the pelicans who were doing just about the same thing we were. The only difference between us and the pelicans was that they were scouting out their lunch and dive-bombing into the water to get it. We swam first and then went up the cliff to the restaurant and ate sizzling hot fajitas on the terrace under a giant palapa, while soaking up the incomparable beauty of the place! Fajitas are incredibly simple to prepare, they're fun to eat and they're delicious. These make enough great eats and good times for eight people. Ole! Ole! Ole! Mariachi music, some Ricky Martin, Julio Iglesias or Marc Antony will help set the mood. Or try some salsa music from Texas. Set yourself up a buffet, kick off your shoes and get ready for a fabulous fiesta. As the title above suggests, you can make Fajitas several ways. You can make Chicken Fajitas, Steak Fajitas, Shrimp Fajitas, or even Vegetarian Fajitas by substituting Portobello Mushroom chunks for the meat. Recipes for delectable side dishes follow. You can marinate the meat, shrimp or mushrooms the night before your fiesta. Once the marinating is complete, it will only take about 40 minutes to prepare this delectable dish! Recipe serves eight. Choose between one of these, or mix and match! In large bowl combine chicken, steak, shrimp or mushroom chunks with red and green bell peppers, onion, tomatoes, and jalape�os or green chiles. In small bowl mix together oil, lime juice, vinegar, oregano, Worcestershire, beer, garlic, salt and pepper. Pour over meat and vegetable mixture and toss gently. Cover. Marinate three hours or overnight in refrigerator. About twenty minutes before dinner is to be served, heat a large skillet or wok until very, very hot. Drain off excess marinade. Pour chicken, steak or shrimp mixture into skillet and stir-fry for six to eight minutes, until done. Place in serving dish. Put serving dish on electric or Sterno hot plate so that when it's served at the table, it stays hot. Put a bowl of guacamole, a bowl of salsa and a bowl of sour cream sauce on the table. Wrap tortillas in foil and heat in oven, or cook in microwave until steaming. Serve in a bread basket to keep warm. Have each guest put fajita mixture into a tortilla. Garnish with guacamole, salsa and sour cream. Roll up into a burrito. 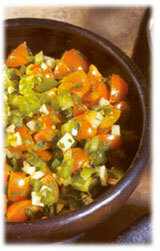 HERE'S A RECIPE FOR SALSA FRESCA: It will take you about 45 minutes to make! Wash all chiles and tomatoes and remove stems. In a large Dutch oven, place chiles and tomatoes in about one inch water. Bring to boil and simmer for two to three minutes. Remove from stove and cool for a few minutes. When you can handle the chile mixture, drain off about half the water and mince, by hand or in the food processor. Put all minced chiles and tomatoes in a large bowl. Dice onions and garlic in food processor and stir into chile mixture. Wash cilantro and cut off the longest portion of the stems. Dice remaining part of the plant in the food processor. Stir into salsa. Add lemon juice and bouillon. Stir well. Place in quart size jars and refrigerate. Depending on quantities of chiles and tomatoes you use, this should make two to three jars of salsa. It's best if refrigerated at least 8-12 hours and will keep for several days in the refrigerator. Serve this as a condiment for the fajitas. 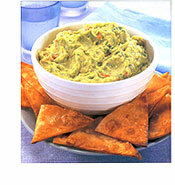 AND HERE'S A RECIPE FOR GUACAMOLE: It will take you about 30 minutes to prepare! Slice avocados in half and remove seed. Scoop avocado pulp out of the skin using a spoon. Mash avocados in a medium-sized bowl. Add lemon juice, diced tomatoes, green onions, garlic, salt and pepper. Add Salsa Verde to taste. Stir well, but stop while it's still slightly lumpy. Refrigerate, covered until ready to use. Can be made up to three hours in advance. Serve as a condiment for the fajitas. WATERMELON FRUIT SALAD: Allow an hour preparation time for this one! Trace a zigzag pattern horizontally around the top third of the watermelon. Cut through melon with sharp knife, removing top. Scoop out all the watermelon flesh except a shell one inch thick. Scoop removed watermelon into balls. Combine all fruit and walnuts in the watermelon bowl. Chill until ready to serve. To make dressing, whip cream with powdered sugar and salt. Blend avocados, pineapple juice and candied ginger until thick and creamy. Fold into whipped cream mixture. Pour over salad and toss gently. Serve. If you love refried beans, then heat up a couple of cans to go with your dinner. Other than that, you should be set. Recipe and tips provided by Ann Hazard. Join author Ann Hazard, as she leads you through four generations of historic Baja culinary adventure. She shares not only her family's favorite travel tales, but also the delicious, easy-to-prepare recipes she has collected and created. By the time you've cooked a meal or two and finished reading the book, you're guaranteed a lasting dose of Baja Magic. The book may even turn your perspective slightly to the South, lighten your heart and forever transform your outlook on life!